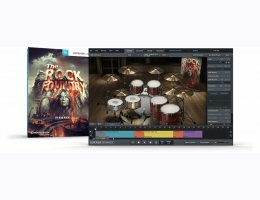 The Rock Foundry SDX features a staggering 65 GB of raw, unprocessed drum sounds recorded by arguably the most notable, influential and sought-after engineer/producer of our time: Bob Rock. If writing and performing a song is magic, the art of engineering and shaping sound is the alchemy that makes music transcend and become legendary. It’s how you position microphones right from the start, how you place drums in a room and how you ultimately process each individual piece to fit in a mix. The latter part is left up to you. Should you rather go for Bob Rock’s drum mixes as a starting point, we’ve included a selection of presets engineered by the man himself. <>Please note: This product requires Superior Drummer 3. ?64-bit host (with support for VST, AU or AAX).